protection to farmers and forest-dependent communities, should companies be encouraged to take on that role? And how do we ensure meaningful participation and consultation with local people affected by land acquisitions? The roaring food prices in 2008 led to an increase in agricultural investments worldwide. In states with weak protection mechanisms and unclear tenure arrangements, there are serious concerns on how this affects people’s rights and the environment. Addressing such concerns, the Guidelines on the Responsible Governance of Tenure of Land, Fisheries and Forests (VGGT), adopted by the UN Committee on World Food Security in 2012, have been widely recognized as a major step towards a human rights based governance of natural resources. One group working with the VGGT in relation to business is the Interlaken Group, which consists of large global companies, well-respected NGOs, as well as the International Finance Corporation and the UK’s development cooperation agency DFID, among others. The Interlaken Group has developed a toolkit – Respecting Land and Forest Rights: A Guide for Companies – to help companies align their operations with the VGGT. 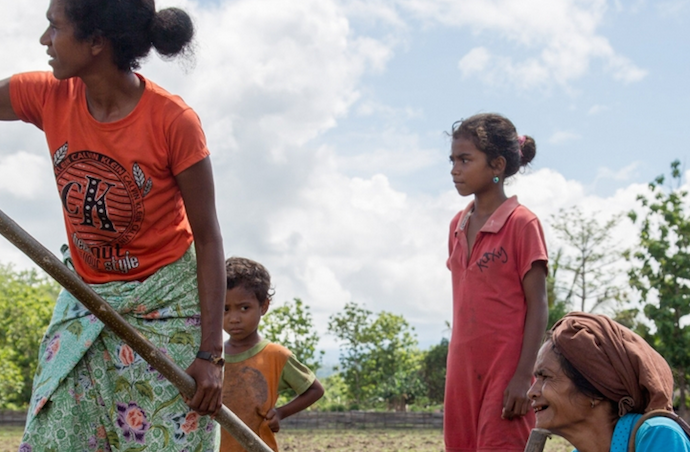 It guides companies on how to approach tenure questions and map existing legitimate tenure claims, emphasising the need to make sure that communities’ voices are heard, with special attention to indigenous peoples, women and the disadvantaged. However, concerns have been raised over how companies are encouraged to take a leading role in ensuring clarity on tenure questions, as supposedly neutral facilitators, when companies themselves often find themselves to be part in tenure conflicts. The morning session will address the work of the Interlaken Group and the role of companies in implementing the VGGT. 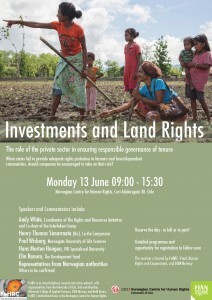 The afternoon session will provide case studies on land acquisitions, with focus on the need to involve local people. Free, prior and informed consent – FPIC is a key concern in this regard. Join us for the whole day, or for the morning or afternoon session. The seminar is open for everyone, but requires registration! The registration deadline was on Thursday 9 June. Please contact Marit Erdal on marit.erdal(at)fian.no if you missed the deadline, but are interested in attending the seminar. Link to our Facebook-event here! FoHRC is an interdisciplinary research and action network, with representatives from the University of Oslo, Oslo and Akershus University of Applied Sciences, FIAN Norway, and Redd Barna. FoHRC’s institutional home is the Norwegian Centre for Human Rights.